Laundry Carts, otherwise known as linen carts, are very large commercial carts that are constructed using lightweight, rigid plastic or flexible canvas and are mounted on wheels. These carts are designed to allow those in the hospitality industry such as hotels, resorts, and even medical facilities to collect and deliver linens. Linen carts are constructed so that they are approximately 5′ to 6′ feet tall and are narrow in order to accommodate being pushed down hallways. This design prevents the carts from blocking walkways and hallways while linens are being collected and distributed throughout the facility. In addition to their sturdy, space saving design, they are also equipped with a cutout at the side which allows for rapid loading and unloading of used and fresh linens. The linen cart is one of the most useful and versatile pieces of equipment being used in many different industries. They are critical for those operating hotels and resorts as well as those running large commercial laundry facilities, hospitals, nursing homes and more. While the basic design is much the same for most linen carts, there are a few options available such as the addition of a removable panel that can be locked for secure storage. Having many quality linen carts in your facility will increase the efficiency and productivity of your employees and ultimately the satisfaction of your guests, adding more money to your bottom line. If your business is looking to add additional linen carts to your operation, check out the selection of carts offered by Container Exchanger. They offer both new and used linen carts on both plastic and canvas designs from suppliers all over the United States, Canada and Mexico, so you will not only save money on your purchase, but on shipping costs as well. This entry was posted in Carts, Laundry Carts on July 21, 2014 by madden_david. Produce and agriculture bins come in a variety of materials, shapes and sizes. There are small plastic totes, often referred to as handheld totes, which can be used for produce harvesting, storage and shipment. Large corrugated cardboard boxes with vent holes are great for bigger produce items such as watermelons. Reusable bulk plastic containers with mesh sides can be used for an assortment of harvesting needs, like melons, citrus, apples and pears. Here you will find an offering of each type of harvesting tote and produce bin available through Container Exchanger. Click on one of the links below to narrow down your search for the perfect agriculture container. This entry was posted in Bulk Containers, Food Totes & Trays, Gaylord Boxes, Nesting Totes, Pallet Containers, Stack & Nest Totes, Stacking Totes, Totes on July 16, 2014 by madden_david. When it comes to farming fish, the one thing that fish farmers simply can’t do without is a safe, reliable way to transport live fish as well as support various fish farming activities. Insulated containers are the perfect solution for both raising your fish as well as shipping live fish. 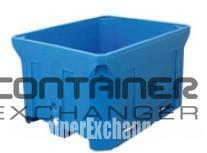 These containers are lightweight, durable and cost effective. These containers are made from industrial grade heavy duty plastic which allows them to be used over and over again for many years without worry of leaking, warping or cracking. Container Exchanger offers new and used insulated containers for sale for fish farmers who are looking for quality insulated containers to raise and transport fish in. They work with one of the largest networks of companies that offer both new and used insulated containers for sale in order to be able to offer you the best prices on these flexible storage and shipping solutions. By buying your insulated containers from Container Exchanger, you can save money on your insulated containers and improve your bottom line significantly. With suppliers located throughout North America including Mexico, Canada and the United States, there are insulated containers available in many different shapes, sizes and colors which can not only help you grow and transport your fish, but can also help you organize your fish farm for more efficient operations. So, if you are a fish farmer who is in need of quality insulated containers or are looking for a cost effective way to address your shipping and operational needs, look no further than Container Exchanger. They have the perfect solution for your needs. For more information regarding the insulated containers offered by Container Exchanger or to inquire about how insulated containers can help you save money and improve the operation of your fish farm click here. This entry was posted in Bulk Containers, Insulated Containers on July 15, 2014 by madden_david.